San Diego’s Metropolitan Transit System (MTS) secured an $18 million competitive grant, while the San Francisco Municipal Transportation Agency (SFMTA), which oversees all transportation in the city, including Municipal Railway (Muni), will receive over $9 million from the U.S. Department of Transportation (DOT) through its “Ladders of Opportunity” program to purchase new buses. San Diego’s award was the second largest grant awarded in the nation. 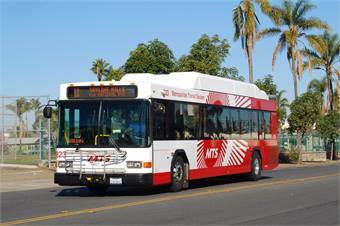 MTS will use the grant funds to purchase 45 Gillig buses powered by compressed natural gas (CNG), replacing older models that have reached the end of their useful life due to age and mileage. Gillig is a California-based company. The new buses will be manufactured in California, include on-board video surveillance inside and outside the vehicle, new wheelchair restraint systems, disk brakes, CNG tanks with 20-year lifespans and enhanced cooling systems. Meanwhile, Muni will add 12, 60-foot buses to help meet the growing demand of the city of San Francisco’s transit needs, address existing crowding, improve service reliability, and increase economic opportunity by improving access to jobs and services. The funds will enable SFMTA to convert routes that are currently serviced by 40 foot buses to 60 foot buses. Upgrading routes to 60 foot vehicles is a cost effective way to increase capacity while minimizing increased operating costs. By operating efficiently and ensuring adequate and reliable vehicles, the SFMTA will further improve its service performance and provide a more convenient and comfortable experience for customers. The $100 million “Ladders of Opportunity” competitive grants were given to applicants who directly enhanced access to work, offered transit access to educational and training opportunities and access to basic services for veterans, seniors, youths and other disadvantaged populations. The U.S. DOT received 446 proposals from 282 applicants requesting a total of $1.4 billion. Of those, only 24 agencies in 19 states received a portion of the $100 million available. The City of Detroit received the largest grant award at $25.9 million, followed by MTS at $18 million and the Central Florida Regional Transportation Authority at $9.4 million.